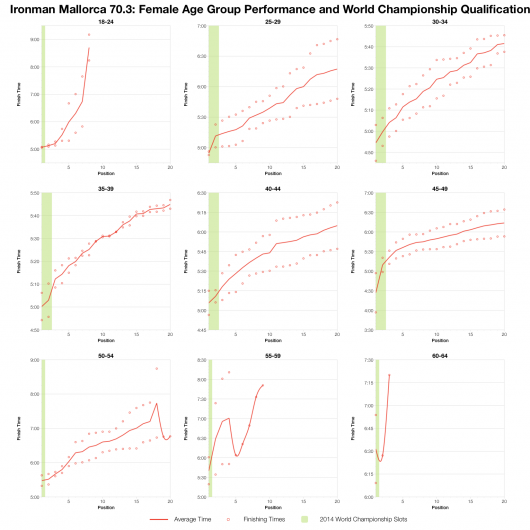 Normally I don’t look at Ironman 70.3 results – the events breed like rabbits and it would be a full time job analysing them – but I can make an exception when a few of my athletes, plus many I know, are racing. 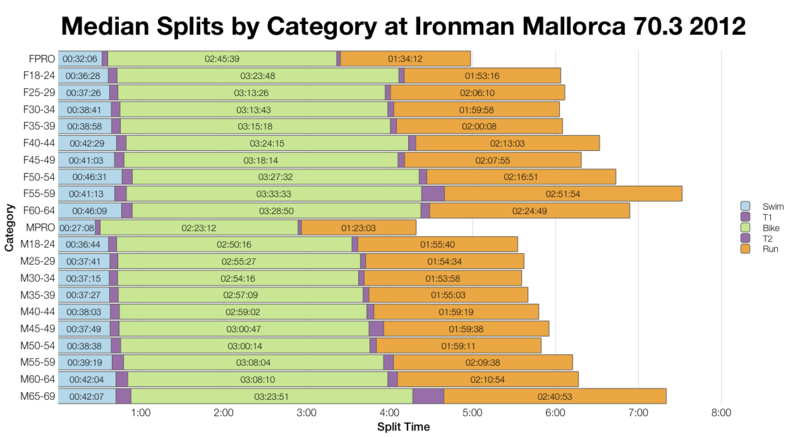 So I adjusted my toolkit and fetched a couple of years of Ironman Mallorca 70.3 results from Ironman.com (I’d have grabbed 3 years, but the results for 2011 are in no fit state for use) to see how the race stacks up. I’m only going to take a quick look, I’ve little comparative data on 70.3s with which to place Mallorca in context, but I can give some general statistics on race performances. 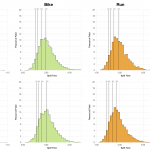 Two years of finisher split distributions show a degree of variability in performances between 2012 and 2013 with 2013 being the faster year. Both swim and run were notably faster in 2013 over the previous year while the bike remained largely unchanged. Presumably conditions were a little more favourable in 2013. And of course the same is true when we consider the median splits too – 2013 faster in swim, run and overall times, but largely comparable on the bike. No Kona slots on offer in Mallorca, but there are 50 slots for the 70.3 World Championship (this year in Mont-Tremblant) up for grabs. Handily the expected allocation is given in the athlete information document saving me having to estimate these figures myself. 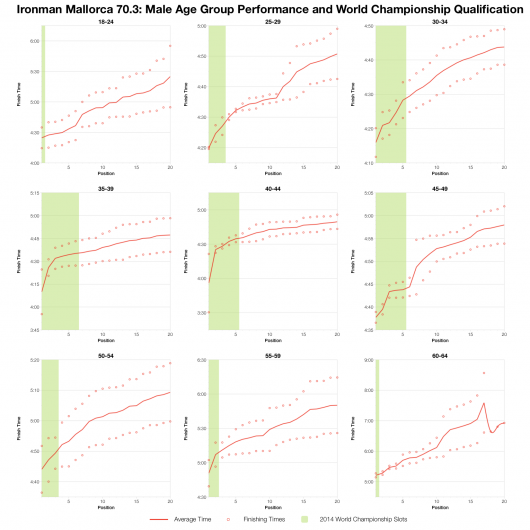 Ironman 70.3 is a younger man’s game and where the M40-44 dominates most Ironman distance races, M35-39 takes the biggest chunk of the slots here. 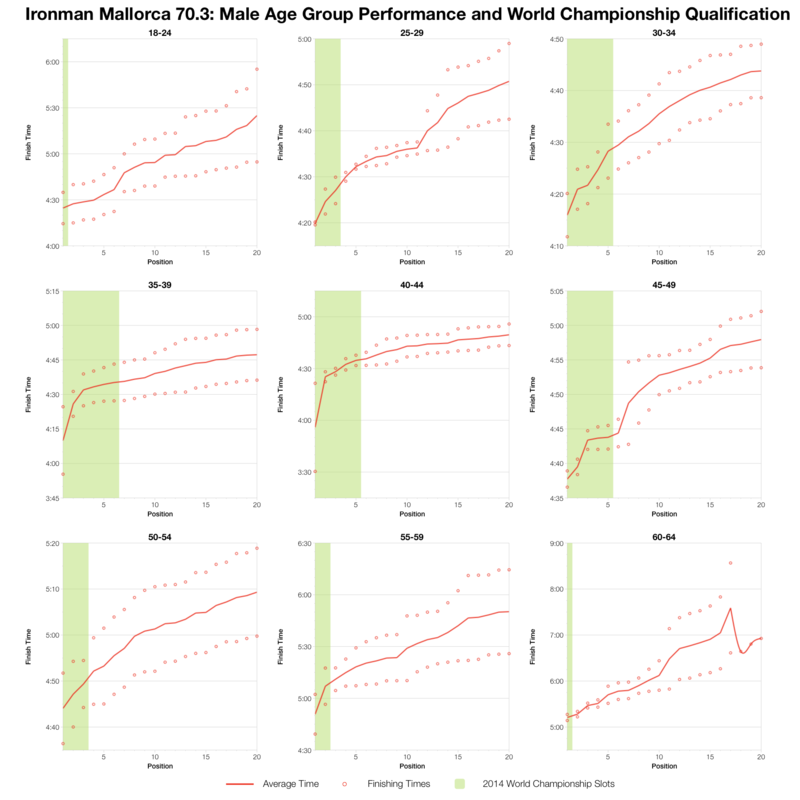 Based on the above graphs times around the 4:30 mark and below, or 5:00 for women, will be needed for qualification in the main age groups (25-44). I’d also note there seem to be a lot of instances where the age group winner or top 2-3 are distinctly faster than those behind them. 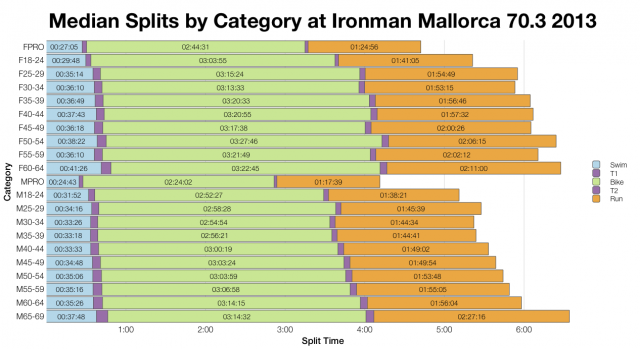 It’s not unusual to see this in the longer Ironman distance races, but it seems more pronounced over the half distance. 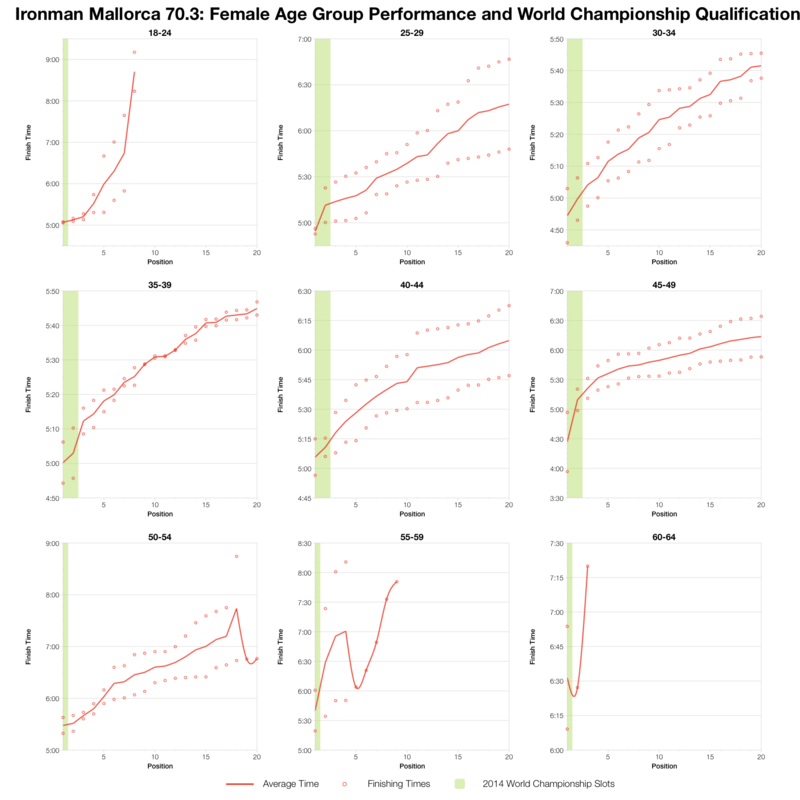 After the weekend I’ll follow up with an analysis and comparison of the 2014 race and will hopefully have some athlete data to look at too.